2012 was one hell of a year for me. I can vividly remember writing my blog entry about ‘making the step up to the next level’ at the start of the year. It was actually the process of writing the entry that allowed me to take a step back from the moment and look at things from a slightly bigger perspective. I don’t think I would have ever made the jump into the pro ranks if I had not written that entry. The process of writing things down, somehow allows me to appreciate the moment, the memories, from a different view point. That is the only way I can really describe it. Anyway, I made the step up AND held my own! Something I am incredibly proud of. It is funny how the ‘goal posts’ constantly change. Carli and I moved house recently and I was going through things in the attic. 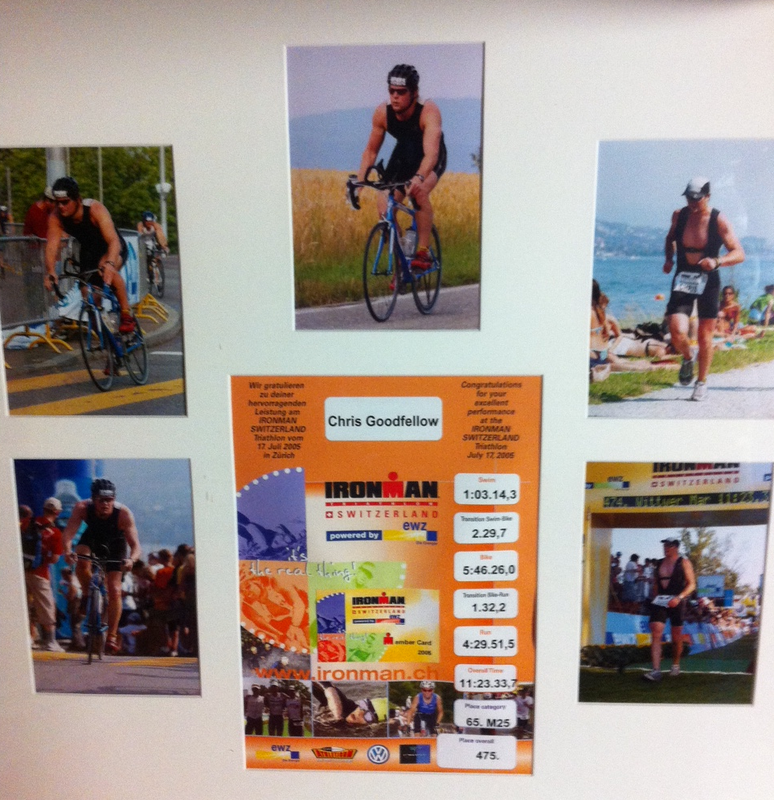 Up there I found a massive framed picture of my first Ironman. Ironman Switzerland, 2005. I looked so different back then!!! And my times….. I can remember the whole day like it was yesterday. From hugging my Bro before the start, to the very last km of the run, where my Mum ran along side me (that is how slow I was moving) shouting at me to keep going!!! It was a very special day. Since then the ‘goal posts’ have changed dramatically. In fact, the ‘goal posts’ are pretty much on a different pitch entirely. But here is the funny thing. Looking back at the memories of my first Ironman in 2005, I honestly could not say whether finishing my first ever Ironman, or breaking into the top 10 in the Challenge races last year, was more special. The ‘goal posts’ may be on a new pitch, but it makes very little difference. I guess that is the great thing about sport. AND…. the ‘goal posts’ are STILL MOVING. At the start of 2012, I set myself a target – 8hrs 45mins. At the time, even saying that out loud, it sounded crazy. But looking at the numbers, the time was doable. I came home in 8hrs 47mins at Challenge Copenhagen, so I was pretty close! Since November, the numbers have just got better and better. So much so, that when I do the maths, the end result just sounds crazy. Totally nuts!! So nuts that I find it hard to even say my goal for 2013 out loud. Let alone, to put it down in words…. Suffice to say, it involves Challenge Roth and the magic number 8. That is about all I can say. July is not that far away, so time for me to get my head down and work harder than I have ever worked before! !